Guess what, guys? It is time for another deep clean! This Saturday I will be emptying out all of the smelly substrate and introducing an entirely new crabitat set-up composed entirely of Eco-Earth. It is a new substance to them because I currently have coconut bark chunks on one side. The deep cleaning process is never fun to do. Luckily, I only have a 20G and it won't be too hard. First I gotta empty out all of the substrate and then clean out the tank with a solution of vinegar and water. Then I gotta boil all of their shells and wash everything they have in there. The entire process takes about an hour to complete. How fun! The good thing is that with this deep clean comes another surprise at the pet store--exotics! I heard that the Pet Supplies Plus where I live is getting a new shipment in on Saturday and they will be carrying some exotics most likely. 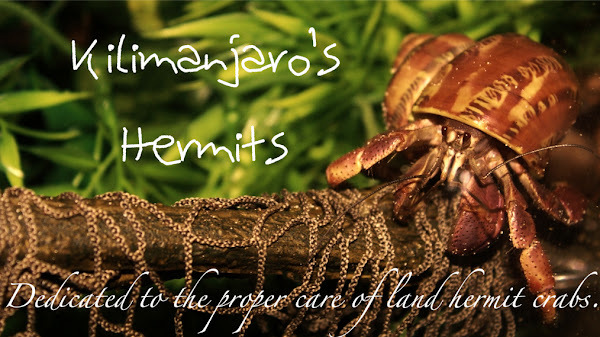 The only problem is that I am going to need to constrain myself from buying too many hermits. I already have 6 crabs in a 20G tank, I only have room for two or three more and then I am pushing the limit a bit. Luckily I have two second levels (and one more coming soon) so the crabs normally are not too crowded. I am really hoping to get a Ruggie and another Viola. If they have any more exotics, I will definately want to pick them up, too. Well, I guess that's all for now. Deep clean pictures will be posted whenever the new crabitat is completed (with which the idea I am going for is not going to be until spring or something).